Approved to drive means Cody has provided their driver’s license number and passed the Turo driver screening process. Born and raised in Louisville, Kentucky. Frequently travel to family in San Luis Obispo, California. I am the owner and operator of a small landscape and construction company. Cody and his girlfriend are the best. Cody was great! Explained all the features and even offered his garage to keep my car safe!. The car was a phenomenal experience! I was on the fence about buying one at the end of this year which was one of the prime reasons i was renting Codys. After renting this car i definitely will be purchasing in December! I personally think turo is a great place to really try a vehicle out before the purchase! Thanks again cody 4 sharing your vehicle with the public a true!! Experience!! Had an awesome couple of days with the car whilst in the US with work. Cody and his gf were great and totally laid back so don&apos;t let the tone of the rules put you off. As long as you&apos;re not a bellend then you&apos;ll have no issues and they&apos;re really accommodating. 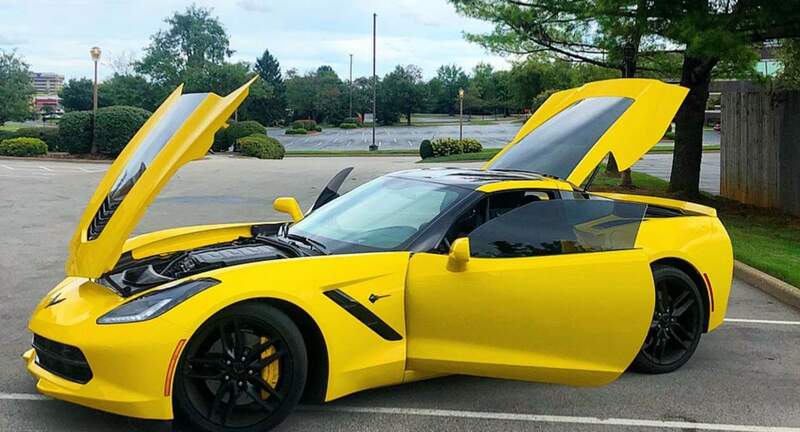 The car is everything you&apos;d expect from a big yellow corvette and many things you wouldn&apos;t. It&apos;s like the perfect woman. Looks great on the outside but doesn&apos;t get too much attention. Quiet and subtle when in public but utterly not shy of jumping your bones and thundering the house down when you&apos;re alone. Be sensible and it&apos;ll be sensible. Wet weather without any of the hiccups you&apos;d be worried about driving a 450bhp rear drive car. Town driving, stop start traffic in automatic without making much noise or drama. It&apos;ll cruise happily on the highway, roof off, sun out. It&apos;s more efficient than I expected and loads of boot space as well considering. And it makes a lie of the phrase &apos;American cars can&apos;t handle&apos;. It feels more like a big Audi than a tractor. But, it is still a Stingray. Start to nudge the throttle a little and it&apos;ll growl. Not threatening, but just letting you know that the car is awake. Switch to manual, twist the car to a more interesting settling and it discards subtlety for that feeling of a big cat just before it launches at prey. Drop the hammer and the car explodes. But not in a way that leaves you shaking in terror. It doesn&apos;t want to scare you, it wants you to do it again. And again. And again. If you&apos;re a petrolhead like me then you&apos;re never going to get tired of being thrown back in your seat, never going to get tired of that V8 dinosaur bellowing and growling and roaring behind you. Do it. You won&apos;t be disappointed. Cody was terrific. Took great care of my car and was very receptive with communication. I highly recommend!